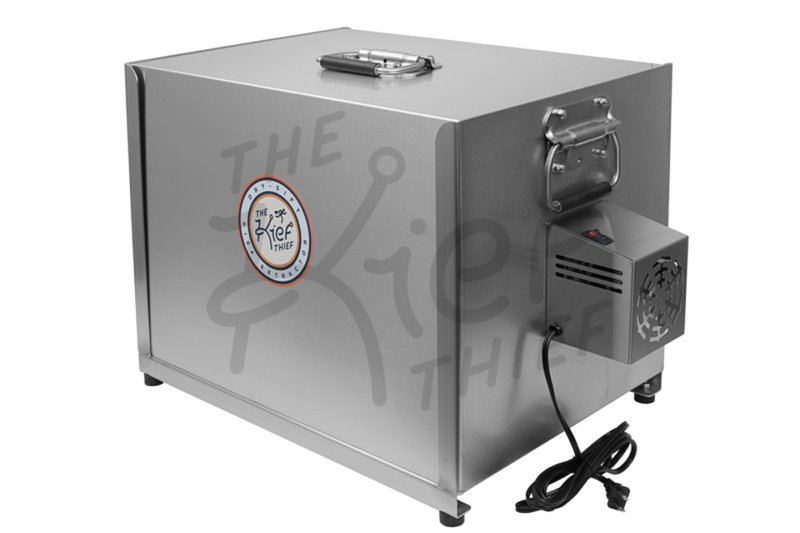 The Kief Thief Dry Sift Extractor - ON SALE! - FREE Shipping! Please allow 1 week lead time on all Kief Thief orders. Every Kief Thief is handmade in Eugene, Oregon from high quality materials, so you know it is built to last. Don’t settle for labor intensive sift boxes or for similar products made cheaply overseas with many plastic parts. The Kief Thief is the only kief tumbler on the market exclusively made with stainless steel and durable polycarbonate and designed for quick and easy collection. The polycarbonate inspection cover keeps contaminates out while also catching the resins which do not collect at the bottom of the chassis. It is also clear, so you can watch the magic of The Kief Thief as it happens. Now it’s time to collect the kief. Turn the machine off and remove the inspection cover placing it upside down. Most of the kief will collect at the bottom of the chassis, but some will stick to the sifter drum and inspection cover. Using a fresh business card or piece of stock paper, wipe the sides of the inspection cover and sifter drum. Then, carefully remove the sifter drum and place it upright on a clean surface. Now, you have access to the bottom of the chassis to collect the kief and move it to storage. Cleaning the Kief Thief once you have collected your yield is super easy. First, use a BPA free plastic bag to cover the sifter drum and turn it upside down to expunge the spent and sifted material (this material can be used for a variety of purposes such as cooking, tinctures or composting). You can then clean the sifter drum while wearing rubber gloves using either a soft-bristled paint brush or an air compressor. If you use an air compressor, make sure not to touch the mesh screen with the nozzle and do not exceed 30 PSI. If the kief tumbler is still contaminated, you can spray it with a solution of 50% to 95% alcohol. The chassis and inspection cover should also be wiped with the alcohol solution. Once everything has dried, you can reassemble the Kief Thief to start the process over again! Remove the clear housing cover from the Kief Thief. Once the sifter drum is installed you can now install the clear inspection cover over the sifter drum. With the clear cover in place, locate the the motor rocker switch and place in the OFF position. Once the power is OFF and the sifter drum has stopped turning you can gently lift off the clear inspection cover. Since the inspection cover will have Kief stuck to it, place the cover upside down on a smooth surface for collection. I've been using the Kief Thief for over a year now and have ZERO complaints. The guy who makes these is awesome! You can call or email and he responds helpfully. The motor is still running strong after 1 year and it doesn't destroy my flower in the kief'ing process. I highly recommend this bad boy to anyone looking for an easy to use, dependable kief extractor.